This holiday season I am teaming up with some of my fellow Fashion Flash bloggers and Evine to share some great gift ideas and a fabulous giveaway, too! If you aren't familiar with Evine, they are an on air - online retailer offering a wide variety of products including electronics, home, fashion, jewelry and beauty. You can shop the item currently on air or go to their website, browse to your heart's content and fill your cart with beautiful gifts for everyone on your list. And, while you're there, treat yoself, too. Speaking of treating yourself... Get your complexion holiday picture perfect with Sonia Dakar Beauty Bootcamp 4-Piece Cleanser, Concentrate, Peel and Serum Set. This four piece set is the result of years of developing high performance skin care to deliver optimal results and whip your skin into shape in minimal time. 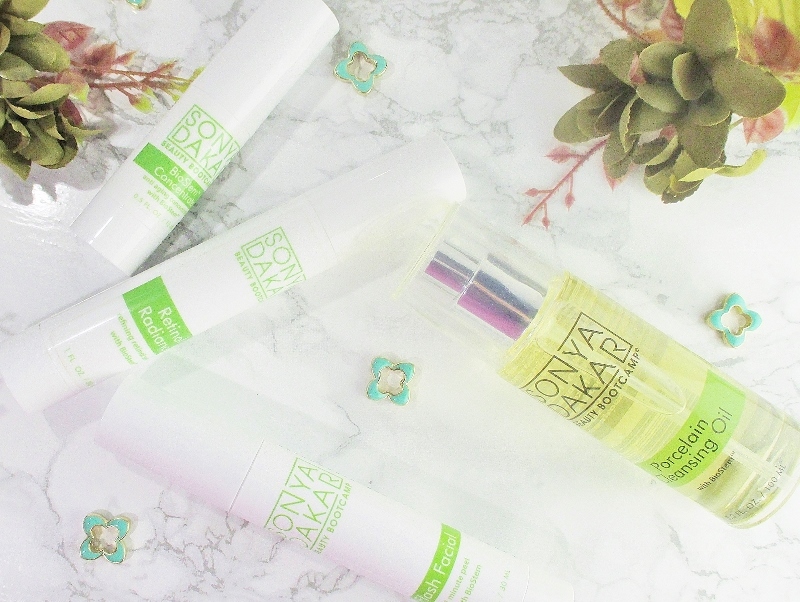 Sonya Dakar Skin Care is formulated with natural and organic ingredients and is paraben, sulfate and artificial dye free. This line is vegan and cruelty free. Beginning with The Porcelain Cleansing Oil with BioStem. Just a couple of pumps of this rich oil mix removes every trace of face makeup and gets my very dry skin sparkling clean without leaving it feeling stripped or tight. I am privileged to try a lot of skin care, doing what I do and in my opinion, this is a standout skin care product. The Flash Facial is new to me and I was skeptical. A one minute peel? Then I tried it. Wow. Just wow. My skin felt so soft after. BioStem Concentrate. This goes on before serums and moisturizers. Concentrates deliver a power punch of beneficial ingredients to the skin. The Retinol Radiance Serum makes me happy. The clear, silky gel smooths on and treats my complexion to one of it's skin care power ingredients, Retinol. This serum is gentle, I experience no stinging or redness. Am I the only one who loves holiday themed jewelry? I have an old Santa pin that I have been wearing for at least twenty-five years. I also have special Christmas themed earrings and an old, careworn holly and berry bracelet that has most definitely seen better days. 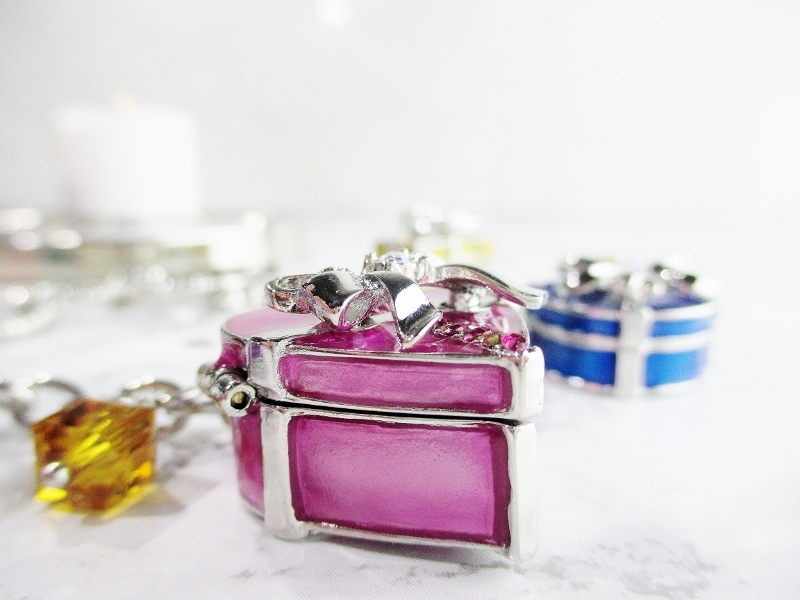 I am so happy to be able to replace that old, tired bracelet with this bright, shiny new Ritzy Couture by Esme Hecht Modern Christmas Charm Adjustable Toggle Bracelet. Ritzy Couture by Esme Hecht is "Bold and Beautiful Jewelry For Women who Follow Their Own Rules." 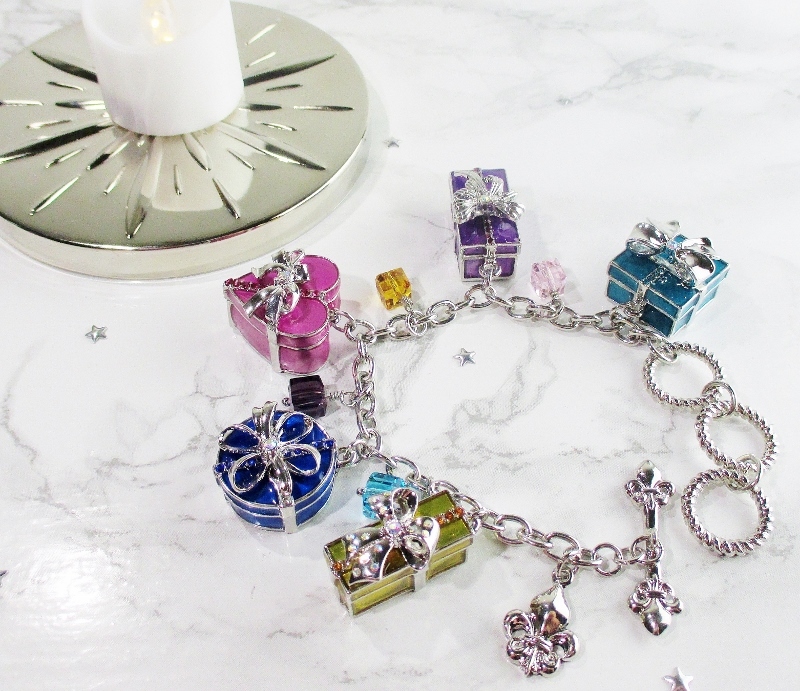 This bright silver tone cable link bracelet is embellished with five beautiful enamel wrapped present charms with sparkling crystal accents and big, silvery ribbon bows. Coloured crystal drops fill in the spaces in between. On one end is a beautiful fleur de lis logo charm and a fleur de lis embellished toggle. On the other end are three large catch rings that allow the wearer to custom adjust the length of the bracelet from 7" to 7 3/4" to 8 1/2" long and fastens securely. This bracelet can be worn alone as a statement piece or stacked with other bracelets or a favorite watch. Did I mention a watch when I was talking about the last item? I do believe I did. I wonder why? 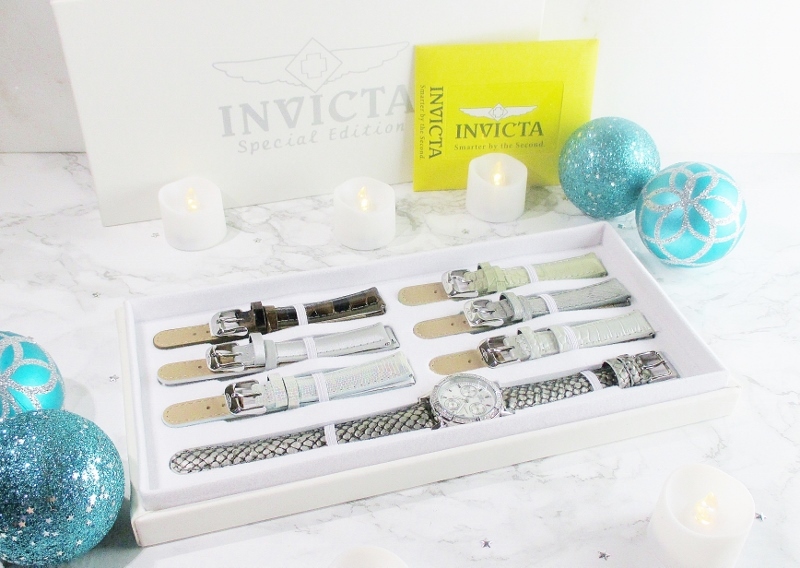 Maybe because I have this beautiful Invicta Women's Wildflower Classique Quartz Chronograph Crystal Accented Watch with 7 - Piece Strap Set. 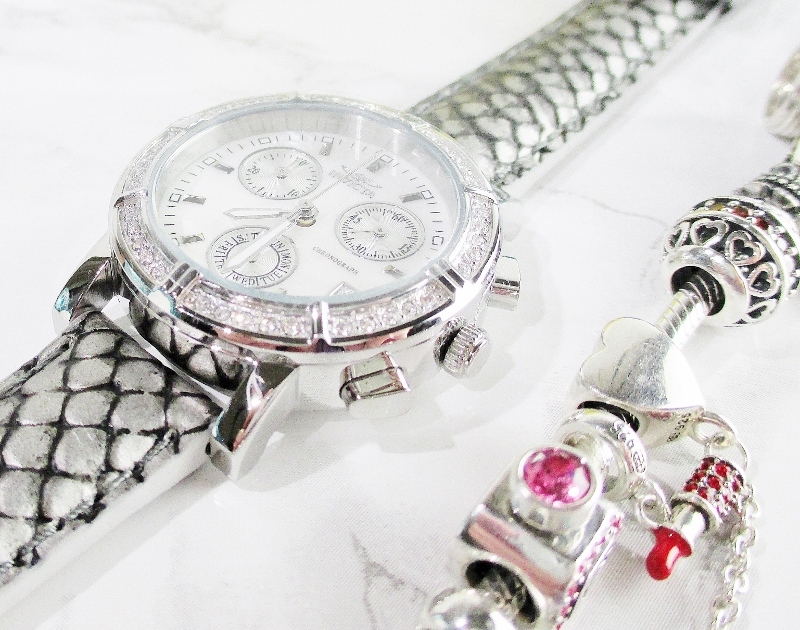 Renowned for quality and impeccable style, Invicta makes timepieces that are elegant, functional and fashionable. Nestled in their beautiful faux leather presentation/storage box is the watch and seven leather straps with silver tone buckles in styles and colours that will take the wearer effortlessly from work, to weekend, to an evening out with that special someone or a fun girls night. This beautiful watch is a genuine, working chronograph. This is not an imitation mocked up merely for show. This watch is weighty and feels luxe in the hand and on the wrist. If, like me, you have never owned and used a chronograph, before fear not. This beautiful timepiece comes with full instructions on how to operate every feature and change out the straps to give you endless looks and combinations that coordinate with any outfit. This giveaway has ended and the winner has been notified. Thank you all so very much for entering my giveaway! I hope that you and yours have a happy holiday season. I'm planning another giveaway, soon so please, keep your eyes peeled! I received some adorable dog slippers.